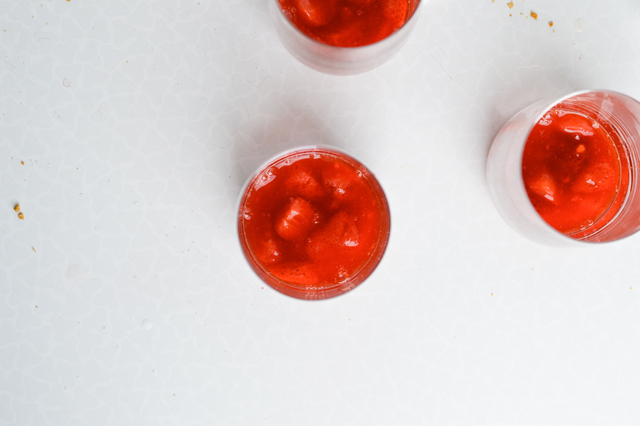 Add some color to your ice cream or soda with this quick strawberry sauce! The memories take me back to a time when I was lucky enough to have a Tamagotchi and iPad wasn’t even a word! That was also the only time in my life I have and will ever wear platform sneakers. Remember choker necklaces and mood rings? Crazy! Among other things that I found fascinating as a kid were fruit and chocolate syrups. The whole selection neatly stacked on a store shelf that I just wanted to bring home with me. I always thought whoever got to have a whole range at home was super lucky. Strawberry, blueberry, forest fruits, chocolate, hazelnut, cookie, … Cookie flavored syrup! I kind of want the same now, I would just change the syrup for makeup or body butters. As far as syrup goes, I now know that certain things just taste a whole lot better when made at home. Doesn’t mean that I sometimes don’t go on nostalgia driven grocery trips, it just means that I usually know better, ha. 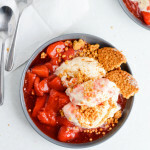 This strawberry sauce is so quick to make, that I believe no store-bought pink stuff can compete with it, not to mention the fact that there are real, fresh strawberries in this. 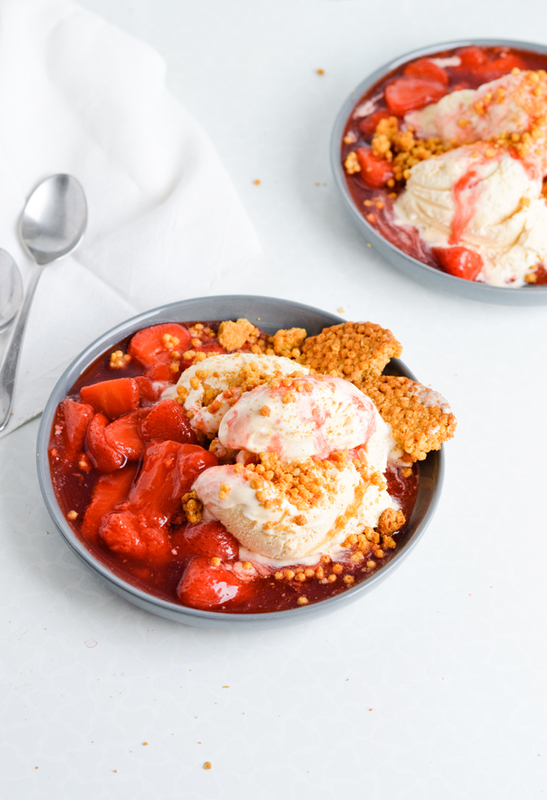 You can use other berries in place of the strawberries, because everything works. I personally love blueberries just as much. 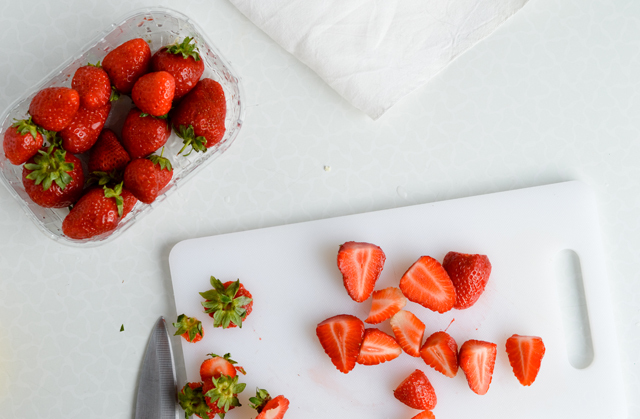 But add raspberries to the mix and you can throw a fruit sauce party! Don’t forget the ice-cream though. 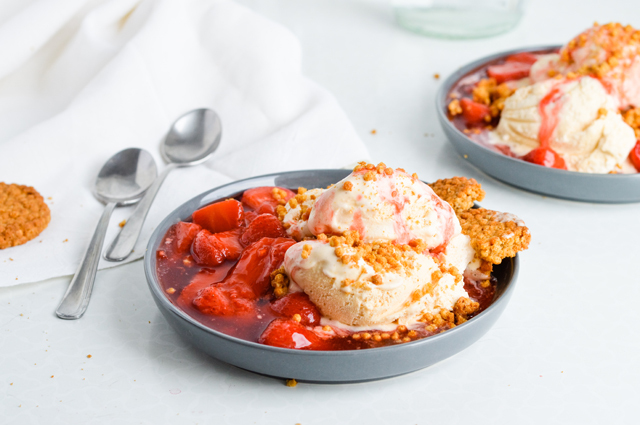 I adore the combination of vanilla ice cream and strawberries, and the addition of a few smashed cookies which add a bit of crunch. It’s a no fuss desert that everyone seems to love, even my grandmother, the one who says she doesn’t like sugar. Yep, she makes this all the time. She skips the cookies though and adds chocolate sprinkles instead. You can use any leftover sauce for drinks! 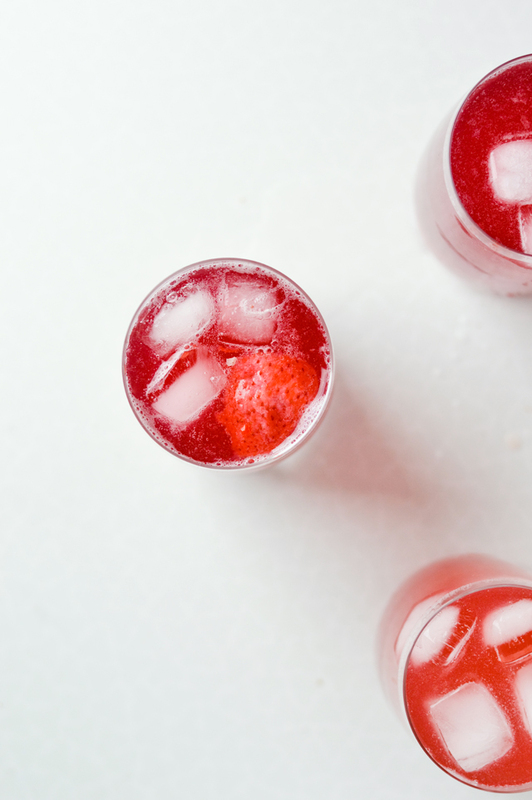 Just add some sauce to a glass along with ice cubes and top with mineral (or sparkling) water or seltzer. If you don’t like whole strawberries puree the sauce first and, if desired, strain through a mesh sieve. 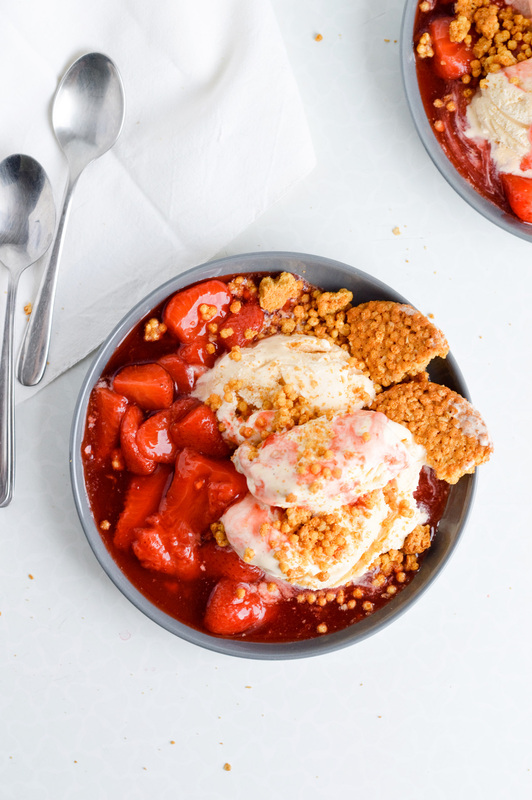 Easy to make strawberry sauce that is a great topping for ice cream, pancakes or waffles. Can be used for drinks too! In a saucepan, combine all the ingredients and bring to a simmer over medium heat. 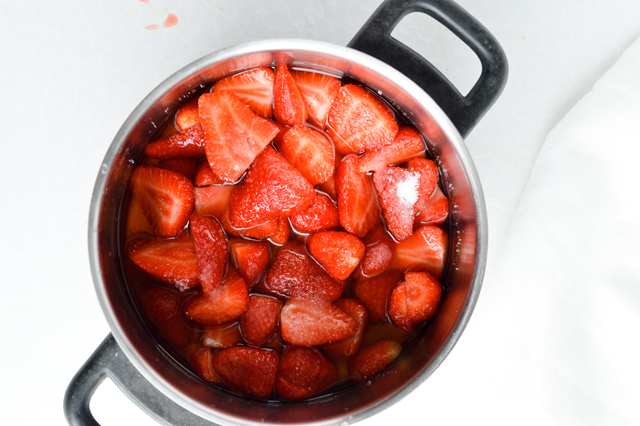 Cook for a few minutes, stirring occasionally, until the strawberries soften and water becomes red and syrupy. 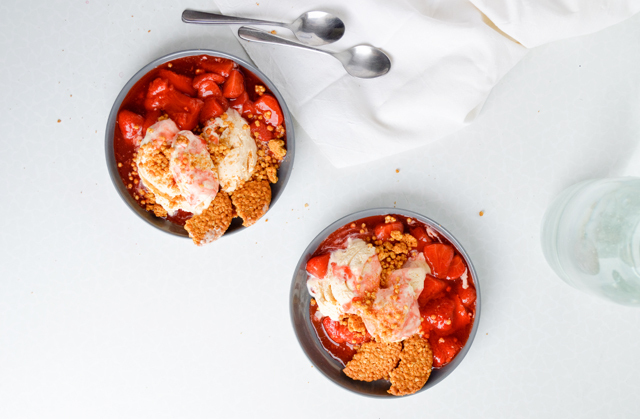 Let cool for a few minutes (or cool completely) then serve with ice cream, pancakes, … whatever your heart desires. Store the sauce in the fridge, it keeps for a week or more. You can use frozen berries if you don’t have fresh ones on hand. Add them to the saucepan still frozen. In case your strawberries aren’t sweet enough or the lemon you’re using is insanely sour do add more sugar.